Judge Andrew Napolitano returned to Fox this morning. The FNC senior judicial analyst was on during the news block of programming, not on an opinion show, where Bill Hemmer began by asking him about his surveillance reporting two weeks ago which got him sidelined until this morning. A few days later, on March 20, Fox News benched the judge. Until this morning. “No change then?” asked Hemmer. “Correct. I think a lot more is going to come,” Napolitano said. Napolitano and Hemmer then discussed the story of disgraced Rep. Aaron Schock (R-IL) whose lawyers claim a former staffer-turned-informant violated the former congressman’s rights. 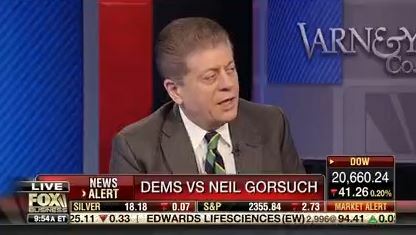 A few minutes later, Napolitano appeared on Stuart Varney‘s Fox Business show to talk about Judge Neil Gorsuch‘s Supreme Court nomination.